Claudia Robles-Angel is a new media and audiovisual artist born in Bogotá-Colombia, currently living in Cologne-Germany and active worldwide. 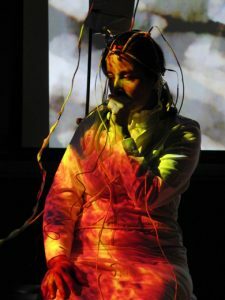 Her work and research cover different aspects of visual and sound art, which extend from audiovisual fixed-media compositions to performances and installations interacting with biomedical signals via the usage of interfaces such as, for example, the EEG (electroencephalogram, measuring brain waves activity). She has been artist-in-residence in several outstanding institutions, for example at ZKM (Karlsruhe), KHM (Cologne), at the ICST ZHdK in Zurich and currently at the CMMAS Morelia. Her work is constantly featured in not only media and sound-based festivals/conferences but also in group and solo exhibitions around the globe, for example, the ZKM Center in Karlsruhe; KIBLA Multimedia Centre in Maribor, Bauhaus Museum für Gestaltung Berlin, the International Computer Music Conferences ICMC in Copenhagen, Montréal and Utrecht; Festival Internacional de la Imagen in Manizales, ESPACIO Fundación Telefónica in Buenos Aires, DRHA2010 Sensual Technologies London, New York City Electroacoustic Music Festival NYCEMF; SIGGRAPH Asia in Yokohama; Re-New Festival Copenhagen; New Interfaces for Musical Expression NIME Oslo; ISEA Istanbul, Manizales and Durban, at 55th Venice Biennale Prohelvetia – Salon Suisse, Audio Art Festival Cracow, CMMR Symposium on Computer Music Multidisciplinary Research Plymouth and Marseille, at Harvestworks Digital Media Arts Center New York City, Museum of Contemporary Art Bogotá, MADATAC 07 Madrid, IK Stichting Vlissingen, Digitale Duesseldorf, the Athens Digital Art Festival ADAF, Heroines of Sound Berlin, Experimental Intermedia New York City and more recently at CMMAS and Radio UNAM Mexico.